← Two Reviews at the Price of One Post!! 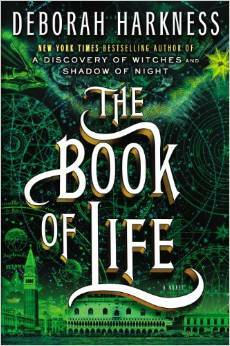 So I’ve already written about the first book in the All Souls Trilogy by Deborah Harkness. 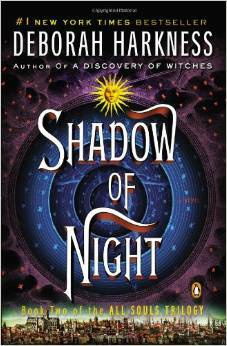 The second novel, Shadow of Night, is the main focus of this post. To be honest, although I love history, and historical fiction, this installment in the trilogy has not been my favorite. There were bits here and there when I would get swept up in the story, but the flow never really stuck for me. I think Harkness tried to cover too much material in Shadow of Night. Diana and Matthew timewalk back to Elizabethan England. They also need to travel, ultimately spending around 8 months in the past, while achieving very little. In 592 pages, the characters accomplish two things, while the rest of the novel is filler and background information. I am not saying that this is a bad book, or not to read it. It does provide many details into Matthew’s past, and many of the details have come up again in the 3rd installment, the Book of Life (but that’s for the next post!). It’s important for the characters to develop and that is what the 2nd book allows the characters to do. However, I do think the story would have worked without the Shadow of Night. I’ll see if I change my mind as I get further into the Book of Life.